If you’re looking for a fast, reliable digital colour printer with wireless networking for your small business, the Brother HL3140CW may be exactly what you need. It takes big business features and packs them into an affordable, compact printer designed to fit your small business budget and workspace. The Brother HL3140CW also offers wireless printing through your mobile devices such as, Apple’s AirPrint, Brother iPrint and Scan, Google Cloud Print, Cortado Workplace and Wi-Fi Direct. The device comes in a combination of light and dark grey colour weighing approx. 17 kg and measuring 16.1 x 9.4 x 18.3 inches. The print resolution of this compact Brother HL3140CW is up to 2,400 x 600 dpi with print speed up to 19 ppm. The device offers two paper input options. There is a main paper tray which is easily accessible as a slide out option from the front of the printer, capable of storing 250 sheets of blanks. The device supports Wi-Fi connectivity for direct printing and mobile printing through tablets and smartphones. The Brother HL3140CW helps to reduce the printing costs by using secure function lock feature to set colour page counts or restrict colour printing for up to 25 users. The Brother HL3140CW offers fast speed, good paper handling and Wi-Fi direct for easy mobile printing but lacks in output quality which would be a primary concern for any small office unit. The device comes with four colour Brother HL3140CW toner cartridges and also supports high capacity toners resulting in low running cost of the printer. It also supports secure function lock feature that restricts colour printing for up to 25 users, offering low printing cost. The Brother HL3140CW printer is an affordable colour printer. It uses Brother HL3140Cw toner cartridges as consumables. Though often times you would experience print quality issues such as horizontal or vertical banding or unclear prints. This dip in print quality occurs due to low ink levels. This is an indication to replace the toner cartridge of the printer. Open the printer’s front cover by pressing the release button on the top of the cover. When the cover opens, hold the printer with one and the drum unit within it with another hand. Pull the drum unit up and lift it out of the printer. You will notice a blue lever on the drum unit. Push it and carefully take the toner cartridge out and place it on a piece of paper. You can also put it in a plastic bag so that the toner powder does not spill out. Open the packaging of the new Brother HL3140CW toner cartridge and shake it from left to right about five to six times. This will help mix the contents of the toner cartridge well. The new cartridge should be opened and taken out of the package only when it has to be used. DO not open the packaging in advance as the shelf-life of a pre-opened cartridge decreases to only 6 months while that of an unopened cartridge is 2.5 years. Take off the protective band from this new toner cartridge and save it for recycling purpose later. Put the new tone cartridge into the drum unit. If it is placed properly then the cartridge will click in place and the blue lever will lift automatically. Clean the primary corona wire within the unit by sliding the blue tab from side to side a few times. Put the drum unit back into the printer and close the printer cover. Q. How many Brother HL3140CW toner cartridges	does the Brother HL3140CW printer uses? A. The printer makes use of 4 ink cartridges. These are available in different individual packs and multipacks which you can buy as per your requirements. Q. What are the physical dimensions and weight of the Brother HL3140CW printer? A. The dimensions of this printer are:- 410 mm (Width) x 465 (Depth) x 240 mm (Height). Its weight is 17.4 kg with consumables. Q. Does the Brother HL3140CW printer support Wi-Fi connectivity? A. Yes, this printer supports Wi-Fi connectivity. 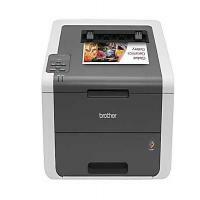 Q. I read that the Brother MFC J4710DW printer is compatible with the Brother iPrint&Scan. What is the use of this application? A. Brother iPrint&Scan is a free application that enables you to print from and/or scan to your Android and iOS supported devices including iPhone, iPad and iPod touch on your wireless network without using a computer. Q. Is it possible to use compatible Brother HL3140CW toner cartridges along with original ink cartridges for printing? A. Yes, you can use our compatible Brother toner cartridges and original Brother toner cartridges with this printer at the same time. You will not face any issues while printing. Q. Will I get a refund if the compatible Brother HL3140CW toner cartridges that I purchase from your website get damaged during transit? A. Yes, we offer the refund if the items turn out to be damaged. In such a situation, the customer needs to contact us on 048 30833221 or email us at info@printerinkcartridges.ie . We will then arrange for a replacement or a refund for the cartridges and the postage incurred by the customer for returning them. Once the item has been returned to us and tested, we’ll initiate a refund in your account. Q. What is the printing capacity of each of the Brother HL3140CW drum units? A. Each drum unit of Brother HL3140CW can print up to 15000 pages. Q. I want to know if the compatible Brother HL3140CW toner cartridges are high-yield cartridges and good at printing? A. Yes, these Brother toner cartridges are high-yield toner cartridges. They are guaranteed to be excellent at printing sharp documents and bright images and also give double output. Q. How many pages do the colour compatible Brother HL3140CW toner cartridges print? A. They print up to 2,200 pages. Q. Are Brother HL3140CW toner cartridges easy to install? Does the printer warranty remain valid if I start using compatible toner cartridges? A. Yes, they have been devised for easy installation and handling. And your printer warranty will not be nullified when you switch over to compatible toner cartridges. Q. Do sellers of the Brother HL3140CW toner cartridges offer attractive offers and purchase terms and conditions on them? Is the quality of compatible toner cartridges really as good as it’s projected to be? A. Yes, sellers of compatible Brother toner cartridges offer a number of deals and terms on their purchase. They include free shipping, 30 days unconditional money back guarantee up to a full two-year guarantee, one year warranty against defects and no-hassle free returns among others. The quality of these compatible cartridges is in every way on par with the supposedly top quality genuine toner cartridges. Q. I need to replace the only yellow toner cartridge in the Brother HL3140CW toner cartridges set that I’m using currently. How do I store the other toner cartridges that I won’t be using in the near future? A. You can store the remaining toner cartridges where the temperature range is between 0 and 100°F. The cartridges also remain in good condition in low humidity spaces, so you need to take care of that too. Q. For how long can I store non-genuine Brother HL 3140CW toner cartridges? A. They can be stored for up to 36 months in an environment conducive to their condition. Q. I wanted to order Brother HL3140CW toner cartridges but my credit card is not working. Will you consider my case and allow cash on delivery payments? A. We are extremely sorry for the inconvenience but we don’t allow payments on delivery. You can pay through PayPal and through cards. You can ask someone else to order on your behalf. Make sure the delivery address is of the place you want it be delivered and not the person’s address. Q. I noticed the price of Brother HL3140CW toner cartridges is commendably low than the original counterparts. Where is the exact cost cutting done on? A. The compatible version is nothing but refilled or remanufactured version of the cartridge. Not being made from the scratch these cartridges have low making price and thus cost less. Buying the compatible version on Brother cartridges would save you money providing the same results as of originals. Q. What is the criteria for bulk orders? My academy office needs huge amount of prints daily and thus wanted to order Brother HL3140CW toner cartridges. Will there be a discount on the same? A. Bulk orders function on extremely different policy. Not all cartridges can be ordered in bulk. Please contact our customer care services on +44(0)28 308 33221 or drop a mail to us at info@printerinkcartridges.ie for assisting you on whether your cartridges are eligible for it or not. Q. Is there any provision for refilling existing cartridges? My Brother HL3140CW ran out of ink and I wanted to refill them. Do you have refill kits as they will save on money? A. No, we don't sell refill kits .We have compatible version of Brother HL3140CW toner cartridges which are refilled cartridges and are already low priced. You can have a look on the compatible cartridge packs on our site. Our compatible versions offer you great results at minimal costs. Q. Is it advisable to use Brother HL3140CW toner cartridges in some other printer also? Will it affect on efficiency? Q. With what OS can drivers for Brother HL3140CW printer work? A. The compatibility of printer depends on printer driver. The Printer Driver Compatibility for brother HL3140CW printer is with Windows OS, Mac OS and Linux OS. Q. Which type of papers are recommended to be used in brother HL3140CW printer? A. The Paper Handling Size of the Manual Feed of printer is as follows: Letter, Legal, Executive, A4, A5, A6, B5, B6, Envelopes, Custom Sizes (3.0"-8.5" (w) and 4.57"-14" (l). Printing on these sizes are recommended. Also using the media type as Plain, Bond, Envelopes, Labels, Recycled Paper and Glossy Paper is highly recommended for clear and long lasting prints. Q. Where is your delivery limited to? Is there any specific time in which you guarantee the product delivery? A. Our delivery services reach out over the span of Ireland. The delivery is done by our third party courier partners who have always been punctual with their job. It usually takes 24 hours to deliver, but due to workload it might take 1-2 days. For more assistance regarding deliveries feel free to call customer support services on +44(0)28 308 33221 or drop a mail to us at info@printerinkcartridges.ie.